If you don't have Eclipse and just want OSGi, click here to get the JAR from the Equinox download site. 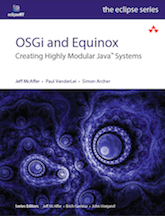 The Equinox OSGi implementation is extremely configurable. One of the most common configuration scenarios is to have the framework automatically install and run a set of bundles when it is started. You do this every time you run Eclipse the IDE. Here's how it works and how you can use it in your situation. Where config.ini is a Java properties file that contains the following line. Note that the osgi.bundles property is quite powerful. See the doc for details. When the Update configurator bundle starts, it automatically discovers and installs all the bundles in the plugins directory that is beside the Equinox JAR. Note that the configurator does not automatically start these bundles. When the equinox launcher is used all bundles (including the framework org.eclipse.osgi) must be placed in the plugins directory which is beside the native executable (eclipse.exe). The equinox launcher is configured by default to run an eclipse application. If an eclipse application is not found then the OSGi framework is shutdown and equinox will exit. To prevent this another property must be added to the config.ini (osgi.noShutdown=true). The final config.ini will look like this. Most of these facilities are experimental. Some general and have been proposed for inclusion in the OSGi R4.1 or R5 specifications while others are Eclipse-specific. All were put in place to solve real problems that we (or our consumers) were having. You may be having related problems. The Eclipse SDK includes some very sophisticated tooling for defining, developing, debugging, building and deploying bundles. To use this tooling run the SDK and mentally replace the word "Plugin" with "Bundle" in all the menu/wizard entries. For example, File > New > Plugin Project creates a project suitable for coding OSGi bundles. The "Plugin Editor" is really a bundle editor with some extra support for Eclipse constructs such as the Extension registry. Questions and comments should go in the equinox newsgroup. Development questions can go to equinox-dev@eclipse.org.